D.H. Lawrence remains one of the most popular and studied authors of the 20th century. 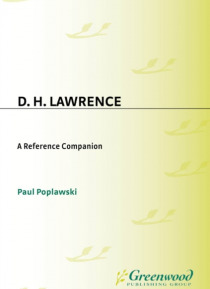 This book is a comprehensive but easy to use reference guide to Lawrence's life, works, and critical reception. The volume has been systematically structured to convey a coherent overall sense of Lawrence's achievement and critical reputation, but it is also designed to enable the reader who may be interested in… only one aspect of Lawrence's career, perhaps even in only one of his novels or stories, to find relevant information quickly and easily without having to read other parts of the text.The book begins with an original biography by John Worthen, one of the world's foremost authorities on Lawrence's life and work. The chapters that follow provide separate entries for all of Lawrence's works, except for individual poems and paintings, with critical summaries, discussions of characters, and details of settings. There is also a complete overview of Lawrence and film, with the most complete listing available of film adaptations of his works and of criticism relating to them. Each section of the book provides comprehensive primary and secondary bibliographical data, including citations for the most recent scholarly studies. Maps and chronologies further trace Lawrence's travels and his development over time.